Many young Americans grow up with martial arts as one of their first competitive sports/activities. Not only is it a great activity that keeps participants physically active, but it instills a sense of achievement and ethics, as you work your way up to earning a black belt. Even if you have no previous experience in martial arts, here are eight reasons why it is still a great activity to pick up even as an adult. Martial Arts is not just for kids! As an adult who started training later in life, I can attest to its benefits! Among others, it provides…. Martial Arts can be a high-aerobic workout that uses every muscle group in the body. Your stamina, muscle tone, flexibility and strength will all improve with martial arts. Cardiovascular health, improved muscle tone and even weight loss can occur! The total-body nature of martial arts means hundreds of calories are burned during every class. Natural eating signals can become better regulated so food cravings can disappear too. Due to the goal-setting, positive encouragement and respect that are a part of martial arts programs, the greatest benefit usually reported by students is great self-confidence. You can become more comfortable and confident in all situations – whether in danger or simply doing a task outside of your comfort zone. You will discover you can accomplish anything you set your mind to! Research has found that by participating in martial arts you not only improve your reflexes while in class but actually experience faster reaction times in all areas of your life! As Bruce Lee pointed out, behind the punches and kicks, a true martial artist learns to sit with himself and see where his or her weaknesses exist. As a martial artist, you will learn what it is to be still, challenged and focused. At Kaju AZ we work to instill the black belt principles of Courage, Honesty, Respect, Integrity, Self-Control and Loyalty into all areas of our lives. Researchers have proven that participating in regular exercise is one of the best ways to improve your mood. Not only will you relieve stress and frustration but it may actually help you become happier! 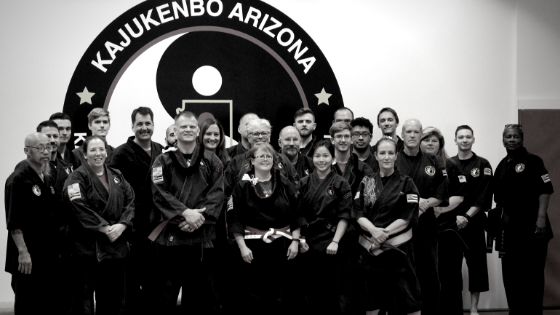 Kajukenbo Arizona is a positive, encouraging, judgement free school with scalable workouts and flexible training schedules. Contact us today for a free trial! We have family, veterans and law enforcement discounts too! Hope to meet you soon!